When Linnaeus in the mid of the XVIII century collected the information on this bird in order to classify it taxonomically, noted as main reference its odd migratory behaviour. He had noted that in North Europe the females in autumn began the migration alone, abandoning the males to a life of celibate, and so he decided that this peculiarity had to be mentioned in its scientific name. Then as it was usual in that century in the use of the Latin nomenclature, he committed the usual error of transcribing the term “caelebs”, rightly single, in “coelebs”, linguistic imperfection accepted at that time as equivalent. The Chaffinch (Fringilla coelebs Linnaeus, 1758) belongs to the order of the Passeriformes and to the family of the Fringillidae, a very vast group that includes small songbirds often very coloured, since ever among the most sought cage and breeding birds. This characteristic added to the facility of hybridization between the species, has originated the creation of an unbelievable number of crossings, often so much complex and multifaceted and so different from the original species to create in the popular tradition, as in the case of the Wild canary (Serinus canaria), a wrong idea about how was the original species. At the beginning of the new millennium, questioned about which was the most common bird in Europe, the interviewees of many countries gave more or less the same response: the house sparrow, the blackbird and the starling, birds certainly very common and numerous, often urbanized and living with us, therefore easy to observe but the reality was quite different. 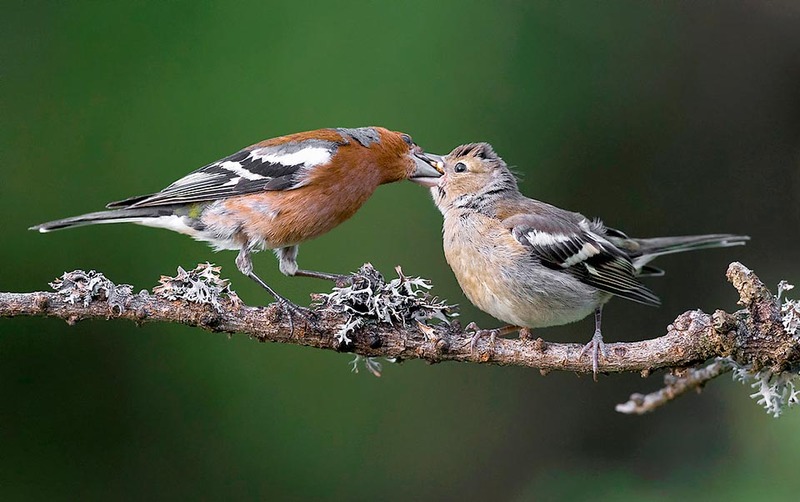 In 2004 Birdlife International estimated that in Europe the most numerous bird was the chaffinch with a population that might reach the surprising number of 240 millions of couples! The other species, though numerous were quite far away, with the House sparrow (Passer domesticus) at the 3rd place, the Starling (Sturnus vulgaris) at the 9th and the Blackbird (Turdus merula) at the 13th. Then in the following decade the situation modified often in a traumatic way with a decrease of many species and conversely an increment and an expansion of the ranges by others. In this commotion the chaffinch has maintained a stable situation consolidating the same levels of a decade ago, on the contrary, giving some signs of improvement in some areas and remaining always the most common bird in our continent. 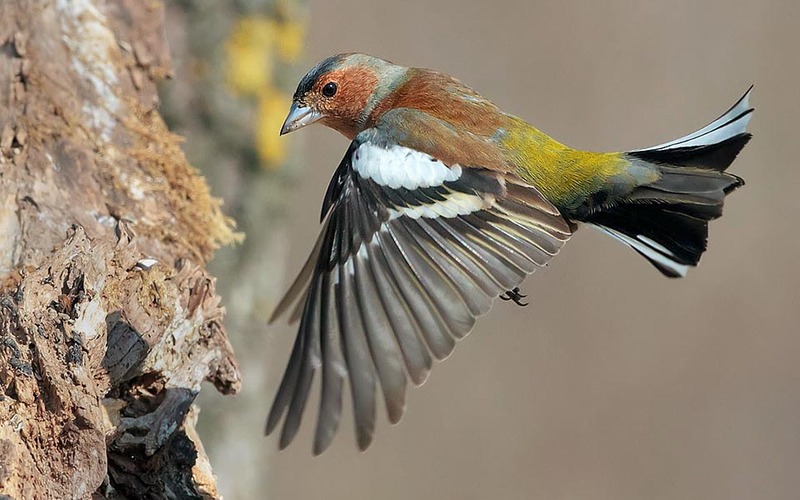 However, contrarily to other specie much less common and more fragil, for which is still now allowed the hunting, for the chaffinch in Italy exists a very particular legislation that practically forbids the hunt with very heavy penalties and often outsized if compared to the damage caused to other species commonly hunted. On the other hand, if we consider that the fate of the chaffinch, harmless and useful bird, is strangely linked to that of the starling that, besides being very numerous is considered as one of the most harmful birds, we can imagine how many times do exist ill intentions about which species are to be protected and which not. 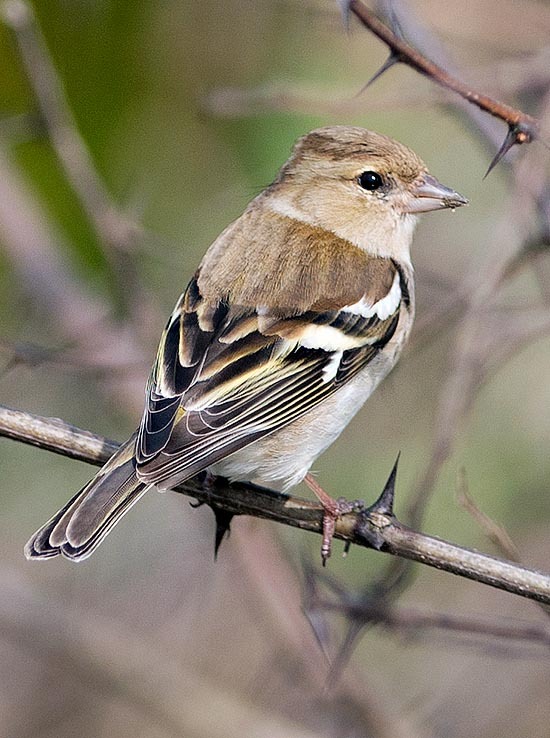 The etymology of the scientific name has origin from the Latin “fringilla” = chaffinch and “coelebs” = single. In Europe is called Chaffinch in English, Buchfink in German, Pinzón vulgar in Spanish, Pinson des arbres in French, Fringuello in Italian and Tentilhão-comum in Portuguese. Palearctic species, it occupies a territory including all Europe, the temperate cold area of Asia with a belt limited north up to the lake Baikal and south up to Iran and Iraq occupying the belt west to Caspian Sea. It lives also in Africa on the Mediterranean coasts of Morocco, Algeria, Tunisia and also in Egypt mainly during the winter period. In the Macaronesia islands is present with various subspecies very characteristic in the colour as well as in the shapes, some now upgraded to level of endemic species. Only in the northernmost territories the chaffinch is a partial migratory species whilst is sedentary in the rest of the range although subject to seasonal migrations with altitudinal and latitudinal movements conditioned by the weather conditions. Due to its melodious characteristics and the facility to keep it in cage the chaffinch has been object of introduction in many overseas countries, in particular in the temperate area of the Southern hemisphere, where it has easily adapted to the new conditions. In New Zealand it is now a very diffused bird with a consistent population now sedentary. In Italy it is widely present in all the alpine and prealpine territory and in scattered spots also in plain where exist the suitable habitats. About twenty subspecies have been determined on which still exists a lively scientific debate, among these are to be reminded that relevant to the Açores (Fringilla coelebs moreletti), the three of the Canarian archipelago (Fringilla coelebs ombriosa, Fringilla coelebs palmae and Fringilla coelebs canariensis) and that of Madeira (Fringilla coelebs maderensis). The chaffinch loves woody habitats at times very thick but also sparse lowland thickets spaced out by ample spaces free of vegetation. 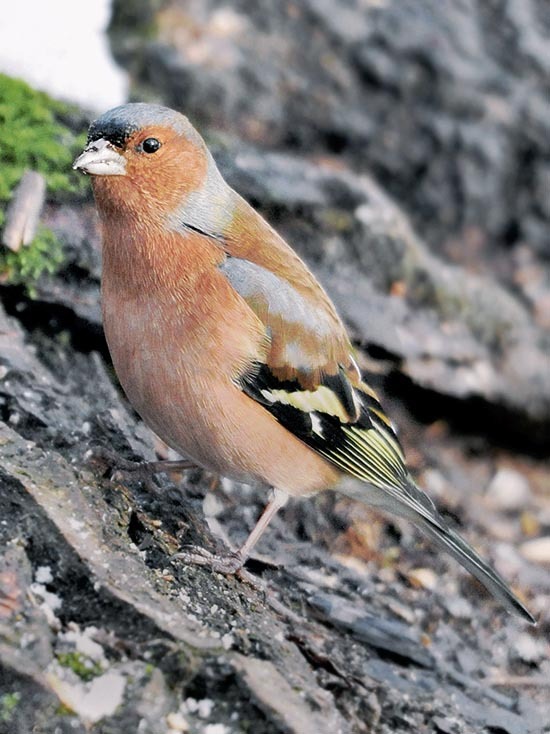 During the nidification it does not love to frequent dry and arid habitats but prefers humid, cool, shady sites with perennial streams, with underwood covered by moss and sparse bushes, as the chaffinch spends a lot of time scratching the ground while looking for food. It prefers the mature forests, with old trees, leafy and tall on which it loves to stay for emitting its unmistakeable song. It is a fairly solitary species and during the nidification gets rarely in touch with other couples of the same species. Conversely, in winter, it gathers in huge flocks while looking for food with bramblings and linnets, serins and greenfinches, with goldfinches and sparrows, in open agricultural areas, farms with stubbles of grain, grassy pastures, gathering then in the evening in thickets even several km far where they will spend the night all together. This situation is maintained often for the whole winter season till when, upon the first spring signs, each species progressively leaves the group until this finally subsides. It has been established that the chaffinch is one of the birds with the greatest number of dialects spoken. More than spoken we should say sung seen that each population shows significant changes in the song exhibiting accents and duration of trills different from one another. Even more in the isolated locations where the populations, besides belonging to subspecies or now to species different from the holotype, have developped rather different languages. 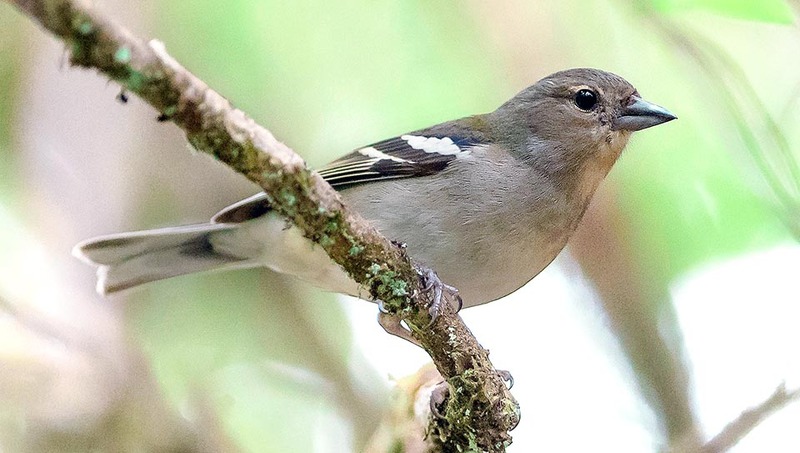 Specific case are the populations of the Canary Islands, of Açores and of Madeira that respectively with Fringilla coelebs tintillon, Fringilla coelebs moreletti and Fringilla coelebs maderensis seem unable to perfectly understand each other. 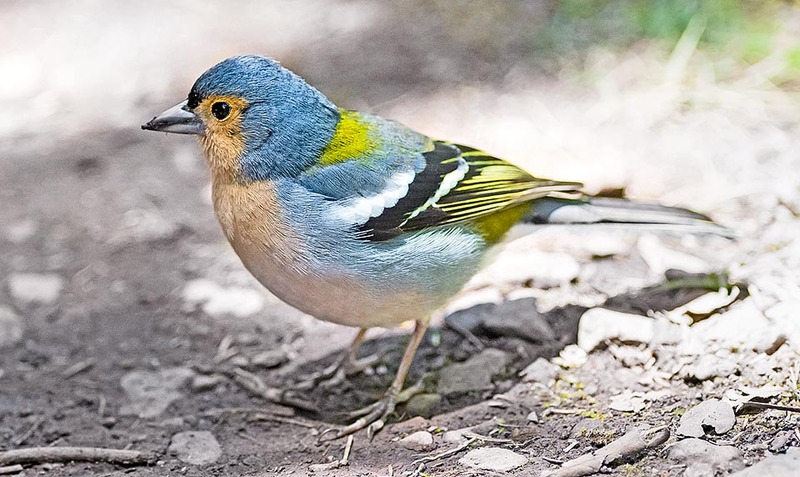 Particular circumstance is the case of the Blue chaffinch of the Canaries (Fringilla teydea) who has maintained almost totally the original song of the continental chaffinch even if getting a remarkable change in the morphology becoming bigger, and as the vulgar name recites, getting a diffused blue colour on all the livery. This bird learns the song from the parents or the similars with whom coexists, passing on the various languages to the later generations. So much that a chaffinch kept far from instructors or not imprinted on its song should not be able to emit a well defined sound. The breeders of this species know something about, as being enthusiasts of this art who, strong of the knowledge of this innate capacity they have, imprint the young practically despatching them to school with singing chaffinches considered the best. The chaffinch is a pretty little bird 15 cm long, with an about 25 cm wingspan and of 25 g of weight. There is a marked sexual dimorphism between the genera, being the male well coloured if compared to the female. The male has the head and the nape of a nice bluish slate colour, the back brown and the wings black, streaked with white with evident white bands on the primary coverts, well visible also when flying. The tail is blackish with light blue nuances with the two outer feathers having white barbs, the overtail of a nice olive green, the cheeks, the neck and the chest are of reddish burgundy colour, very intense during the nuptial period. The bill is light blue pearl with a black band on the front in correspondence to the upper mandible. The legs are flesh-brown. The female, quite similar to the house sparrow, has a greyish colour diffused over all the body with a darker colouration on the alar cover. Only distinctive sign is a white band on the primary coverts, also visible when flying. The juveniles are much similar to the female. In autumn and in winter the livery of the male loses widely the bright colours acquired during the nuptial period even if maintaining the well variegated plumage. The family of the fringillids is very vast and assembles about 150 species grouped in about thirty genera. The genus Fringilla is one of the most reduced as gathers only a very modest number of them. The nest of chaffinch is a small artwork and in the construction repeats faithfully the style of the fringillids, with a perfect circular cup deep some centimetres, of a regularity and a perfection that it is often difficult to ascribe to the work of a bill of such a small bird. Completely of delicately interlaced moss, without the least smear in its rounded shape seen that it’s wound with webs and lichens, then it is covered inside by very thin blades of grass and many small feathers. A real soft and warm alcove. It is the female who cares the construction of the nest under the male’s remote control. 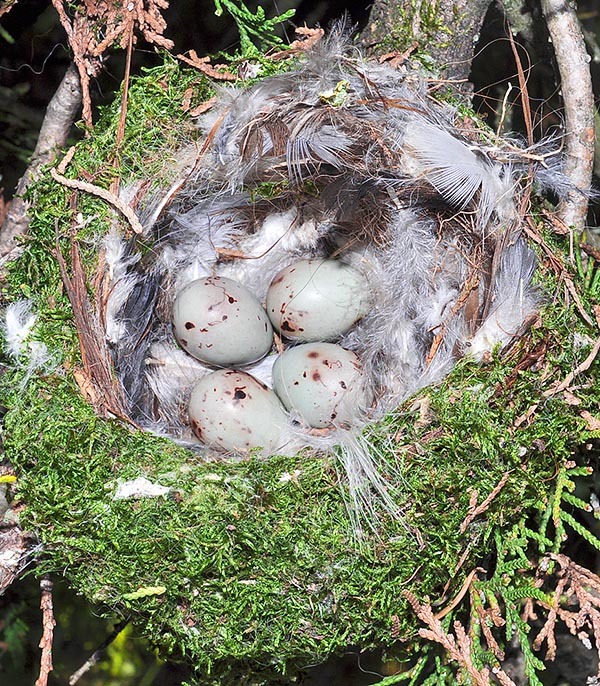 The nest is usually placed at the bifurcation of a branch or on the corner created by the junction of the branch on the trunk but sometimes hidden into the wild ivy or of climbers that wrap the vegetation. It does not like giddy heights and the average is of about three/five metres even if the nests may be found even at greater heights but also lesser, especially on trimmed trees. Are laid 4 to 5 eggs of a delicate light blue colour with small reddish spots that hatch after about 13/14 days of brooding done by the female only. The small nestlings come to life featherless and blind and stay in the nest for two weeks cared by both parents, operation that goes on also during the following weeks until the independence is reached. It usually nidifies once a year in the northern quarters whilst may lay a second time in the southern part of its range. The couples are monogamous and last only one season. The chicks are fed exclusively of insects contrarily to other genera of fringillids purely granivorous that regurgitate predigested seeds. 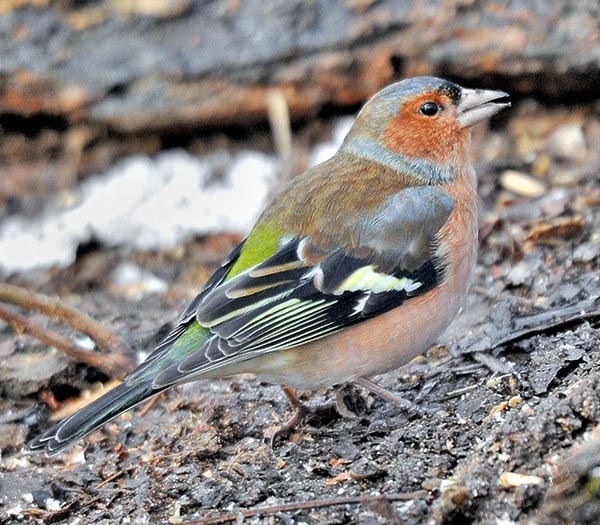 As a matter of fact, the chaffinch is insectivorous during the short period of the nidification eating athropods and other insects collected on the ground but is instead granivorous and frugivorous during the other periods of the year. Its customary predators are pine martens, squirrels and corvids that rob the eggs directly from the nests but is also one of the preys preferred by the Sparrowhawk (Accipiter nisus) and by the Merlin (Falco columbarius) without forgetting the usual night predators such as the Little owl (Athene noctua) and the Long-eared owl (Asio otus). It goes without saying, seen the amazing number of individuals present in the entire occupied territory, more than half a billion of them, the species is not considered as endangered. Two short stories concerning this nice small bird. 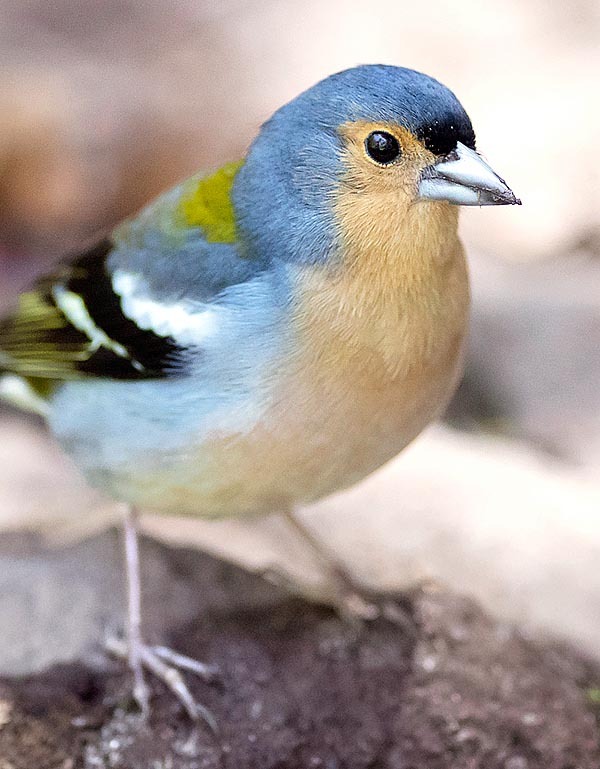 The studies on Darwin’s “Evolution of the species” began rightly from the observation of the 17 species of chaffinch of the Galapagos Islands (Geospiza sp.). Therefore they have had great merit in the scientific world. Its characteristics have entered also the common language. Its cheerful and lively spirit is often recalled in the saying “cheerful as a chaffinch”.